Buy Your Christmas Trees & Wreaths in New Canaan and Support Local Charities! Buy your Christmas tree and wreaths right in New Canaan! The Exchange Club transforms Kiwanis Park into a Christmas village. 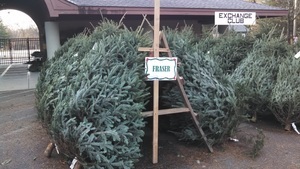 Choose from over 1,300 trees including Fraser Firs and Balsams - along with a variety of wreaths, roping, tree stands and other seasonal merchandise. Save time, avoid crowds, have a great family experience and support our largest fundraiser. Proceeds go to awareness and prevention of child abuse and many other local charities. Santa will be in Kiwanis Park on weekends 11am-3pm. Bring your kids to meet Santa Claus and find out whether they have been naughty or nice! Stop by before picking out your Christmas tree. We have a mailbox for letters addressed to Santa and Santa personally replies (don't forget to include return address). Take a ride around the neighborhood on the Old Faithful Classic Fire Engine. Rides available on Saturdays 11am-1pm in December. Fun for the whole family. Rides begin in Kiwanis Park next to the tree lot.